Massive Union backed Belfast protest against job cuts is attacked by DUP. 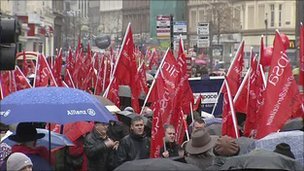 Several thousand people have attended a trade union rally against proposed spending cuts in the centre of Belfast on Saturday. The march began at St Anne's Cathedral before making its way to City Hall. Earlier, the finance minister Sammy Wilson described the protest as a waste of time. He said unions were "giving false hope to people that somehow or other by holding placards they can avoid these financial choices". He also accused the unions of using the cuts to gain political clout. i agree with wilson what is the point of the rally the cuts are coming no matter what. i know of at least a dozen taxi drivers paid up to £800 per month driving patients to appointments while it could be done on a multi lift basis by a driver and mini bus who are already employed by the NHS. also disruptive children getting paid taxis because they fight with other kids on the school run bus. I don`t like the fact that the unions have started a big publicity campaign to draw in addittional membership via the fear factor. They as usual will do very little for the workers. Link to article always a good idea for the OP. Sammy is right though - cuts have to be made. The Unions are playing politics. When you say "for the OP"
whats OP mean,- thanks in advance. He's dead right. If the unions would actually worry about doing something constructive for workers rather than simply agitating every time they don't like something. cuts have to be made. Cuts don't have to be made - a 2% wealth tax in Britain on the richest 10% would raise the £80billion the Con-Dem coalition want to cut. The Unions are playing politics. Damned right they are - and they should do a hell of a lot more of it - with the rank and file controlling the movement. The bankers, developers, spivs and speculators have their political lapdogs dumping the cost of the crisis on the people who had no hand, act or part in it. The trade union movement need to build a new mass workers party to represent the interests of working class people. The "Sammy's right" brigade ( above ) are exactly what the government want. When business leaders draw up plans to create 100,000 jobs in the north, the Tories (who won 0 seats here) cut twice as hard as people expected slashing a predicted 30,000 jobs with a knock on effect of hitting the private sector - losing another 20,000. The economy here has no chance, to say this is the only is ridiculous. The wealthiest in the UK have got fatter off the recession. "There may have been a recession, but the combined fortunes of the richest people in Britain still managed to rise by nearly 30% last year, the biggest increase for more than two decades, according to annual ratings published today." The removal of wealth from the bottom sends it to the top, the Tories are looking after the rich. Massive jobs cuts are not a necessity, the protests are justified.